Nutrients are one of the most important elements to growing great cannabis. At the moment, the choices are vast and widespread with many variations. Some of the main types are organic nutrients, veganic nutrients and salt-based or synthetic nutrients. With nutrients playing such an important role for your plants, making an informed choice should not be overlooked. One thing to look for are companies that are specifically geared towards cannabis plants. In my experience, I’ve found that nutrient companies that are not cannabis-specific tend to have products geared more toward tomatoes or other vegetables, which negatively influences the taste and growth structure of the plants. Most nutrients companies work with either a three-part system or a two-part, A & B system with add-ons or supplements. Generally organic companies or organic lines have a one-part grow or flower formula. 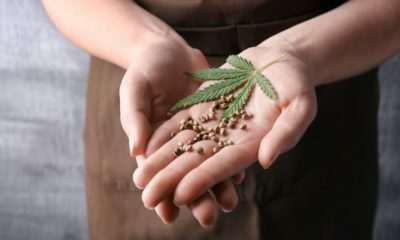 Some things to consider when buying nutrients are: Is the product designed specifically for cannabis? Is the price right for your grow budget? How many different products will you need to get the results you will want? The first is very important because—as I’ve already mentioned—this can adversely affect your buds. It can also mean deficiencies down the road as these nutrients may not be balanced for the medium that you are using. Try and find companies that have done research into cannabis and that understand what your needs as a grower are. Some companies that fall into this category are Advanced Nutrients and Canna. They provide scientifically proven nutrients with cannabis in mind. Another company, Aptus, specializes in boosters and was started in Holland with cannabis growers in mind. These nutrient lines for the most part use a salt-based, A & B system as their basis. Then they add boosters like amino acids and boosters, increasing the P and K and eventually giving you bigger yields. The synthetic salt based nutrients differ from the organic nutrients in that way. The organics are all comprised of naturally occurring elements like kelp and various guanos in order for you to get the N-P-K values that you will need to grow. Additionally, these organics work with your medium, supplying valuable beneficial fungi with the food they need to thrive. This gives your plants expanded root zones, which in turn increases yields. Price is also an important factor to consider. In some cases, adding five different boosters might not be necessary to get the results that you desire. Watch out for combining too many different products, as one might cancel the other out or might be too much combined. Also look out for nutrients containing too much of any main ingredients. Try to stick with an N-P-K value around 5-3-6. When nutrients jump to values like 30-50, it can very quickly burn your plants. A new development in nutrients that has become quite popular these days is called veganics. This style of nutrients was made famous by Kyle Kushman and his veganics line called Vegamatrix. These organic nutrients are completely devoid of animal products and are only made up of plant-based proteins. The added value here is that the plant can break down the nutrients more readily. It can also improve the taste of the finished flowers because the plant is able to completely break down the nutrients. Whatever line you choose, just remember to go easy on your PPM/EC and don’t over feed—that is one of the most common beginners mistakes. Also ease back on your nutes in the very end and flush for at least two weeks, three being ideal.